ATLANTIC CITY - There is no coffee at Chris Matthews' table. So instead of waiting for a server, the fast-talking host of MSNBC's "Hardball" walks over to an unmanned tray cart, lifts up the sheet and grabs a pitcher to bring back to his table. In Matthews' world, patience is a liability. Guests who talk too much are cut off. Topics are abandoned before they have a chance to drag. But Matthews took time Sunday to deliver 30 minutes of verbal riffs on national politics at the Stainton Society's annual brunch for Shore Memorial Hospital financial donors. Matthews' late mother and grandparents were once patients at the hospital in Somers Point. "Normally, I hate having to go to these types of things," Matthews said after he took the podium at a Tropicana Hotel and Casino Resort ballroom. "But when I heard it was for Shore Memorial, I said, 'I'm doing it.'" The Atlantic City visit was a homecoming for Matthews, who spent his teenage summers on the Ocean City boardwalk. "I was the good-looking guy behind the counter at the Chatterbox," Matthews said. Matthews also pumped gas, delivered newspapers and hung out on Central Avenue with the cool crowd during his shore days. "The subculture in Ocean City was so hip," Matthews said. "Guys that knew about Ray Charles." In the crowded political talk-show industry, Matthews distinguishes himself as an equal-opportunity basher with disdain for both liberals and right-wing extremists. He built an audience bashing President Clinton nightly during the Monica Lewinsky scandal, then offered a rare voice against war with Iraq before the fighting began. 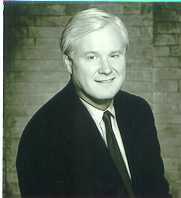 Although he did not shy from his anti-war stance in his speech at the Tropicana, Matthews said he underestimated the humanitarian value of ridding the world of Saddam Hussein. "I'm in journalism to learn," Matthews said. Although Matthews filled his speech with one-liners and comical observations, the biggest laugh came at Clinton's expense. "We have a president who goes to bed every night at 9:30 with his wife," Matthews said. "This is a big change of pace." The host of two talk shows - the nightly "Hardball with Chris Matthews" and Sunday's "The Chris Matthews Show" - Matthews also recently released his third book, "American: Beyond Our Grandest Notions." "Saturday Night Live" impersonator Darrell Hammond cemented Matthews' status as a major media personality when he began imitating the talk-show host in political skits. Hammond portrays Matthews as a no-nonsense wiseguy who speaks in exclamation points and suffers fools gladly, hooting in laughter whenever a guest says something idioitic. "Darrell caught my state of mind," Matthews said, in an interview shortly before his speech. "That's great satire. Sometimes I find myself doing him ... he has my hoot down." The hoot, now a trademark, developed when Matthews worked as an aide for former House Speaker Tip O'Neill. Matthews also served as the top speechwriter for President Jimmy Carter, volunteered for the Peace Corps in Africa and spent more than a decade as a reporter with the San Francisco Examiner. For all his experience with the Democratic Party, Matthews spent most of his speech at the Tropicana bashing its leaders for being "too sophisticated." "Bush speaks English like it's his second language," Matthews said. "Al Gore speaks English like it's the second language of the person he's speaking to." Americans want straight talk, Matthews said, and they want it fast. "The attention span for a cable television audience is 11 minutes," Matthews said. "You have to respect their limited time. If you don't interest the audience, you're going to lose them." In this time of global trouble, I send you a postcard of hope. It's the holiday picture I carry in my heart of a thousand South Africans of every race enjoying a jazz concert together and, with it, this beautiful land's resurgent national vitality. The scene is Cape Town's zesty waterfront area. The group making music is Johnny Cooper's Big Band. The selections are hits made famous in the 1940s by Tommy Dorsey, Ella Fitzgerald, Sarah Vaughn and Louis Armstrong. The crowd is a bright emblem of the country's diversity: three-quarters black, the rest white or of mixed race. Jazz is the unifier of this marvelous tableau. It's gotten people, regardless of color, clapping and tapping to the beat of "Mack the Knife," sharing the dreaminess of "My Funny Valentine," the agreement that, if only for this moment, "What a Wonderful World" it truly is. Unfortunately, this is not the New Year's greeting card we received in the year-end news magazines. Their editors used holiday issues to explain the widening rift between East and West, Christian and Muslim. Here in South Africa, I find evidence of social forces pulling people together. What if people learn to co-exist, even share a national life together? What if the old oppressor learns to deal with the formerly oppressed as a true compatriot? What if the victim of past subservience accepts this change of heart and manner? What if the forces that unite and bind societies outwit those pulling them apart? Here on a two-week visit with my family I saw that "what if" in action. People share their nation with an unexpected ease in the daily encounters between whites and blacks. It's a scene of harmony and hope I didn't expect. Not in South Africa, not yet. As a Peace Corps volunteer in this region more than three decades ago, I spent two years witnessing the regular victory of racial rivalry. The same country that pioneered the heart transplant was obsessed with preventing intimacy between men and women of different backgrounds and had absurd "immorality" laws. More demeaning still was the brutal enforcement of white supremacy, with bosses barking orders and ridiculing the blacks carrying them out. Given the bad blood, I had no reason to believe that replacing white rule with black would change the terms on which people dealt with each other. One brutality, I feared, would be traded for another. Yet I don't think it's happened that way. What surprises me is the strong element of respect and comfort in face-to-face dealings of blacks and whites. So, I return home with more optimism than when I left. Just as there is unexpected trouble in the world, there are also unexpected possibilities. There are forces -- not just jazz -- bonding people together, just as there are those -- think of religion -- capable of driving them apart. No one ever thought that change would come peacefully to South Africa. Holding those first democratic elections in 1994 showed that blacks and whites could vote together. The question was whether they could live together. I now know that they can. So, I share with you a reason for hope. It is not the rioters in the street who matter in the end. It is the people who build and advance societies. Call me an optimist. I know from reading history that the long course of human experience leads toward civilization. I possess no grander souvenir of this spectacular Cape of Good Hope than the vivid, palpable memory of men and women, black and white, sitting together on a warm summer evening and smiling to the seductive optimism of "What a Wonderful World."